Travel Bloggers: When’s the Last Time You Did Something That Really Scared You? 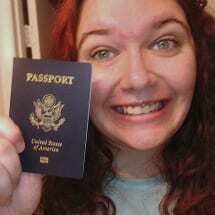 My dorky “I’m so excited to have a passport” face! At TBEX Dublin, I felt a little out of place. There I was, surrounded by people who have seen the world…and I got my passport just last year. Yes, my first passport. Being from the United States, I had been to Canada once as a child before passports were necessary, but until October 2012, I had never been farther away from my East Coast home than California. But although I haven’t traveled to lots and lots of places, I have checked off a destination that many bloggers still have on their bucket list: My very first international travel experience was to Israel. To travel bloggers who are used to visiting locations like North Korea or Yemen or Afghanistan, Israel might not seem like a big deal. But to me, the idea of packing my bags and flying half-way around the world to Tel Aviv for a press trip was enough to make me want to lose my lunch. I’m already a nervous traveler. So as I stood in front of the no-nonsense El Al Airlines interrogator employee peppering me with ridiculously personal questions, like whether or not I had any Muslim friends and if I had recently received any gifts, it was all I could do not to turn around and go home. I seriously almost had a Road Runner moment – you know, where he beep-beeps and leaves Wiley Coyote in a cloud of dust. But I got on that plane (albeit, after all of my bags were flagged as suspicious and double-checked), and headed to a country where I didn’t know a single person. I had the cell phone number of my guide that I was to meet when I landed, but not much else. I took a lot of deep breaths to stay calm, but I made it. And I had an amazing time. A life-changing time (and that’s not a term I throw around willy-nilly). My second international trip would be to TBEX Dublin, and I found myself feeling oddly confident, even though I am not an experienced traveler. It certainly helped that English is a first language in Ireland, and that I was traveling with people I knew. But my experiences traveling to Israel also made me feel like I could conquer the world. Still, I lost a little bit of that wonder I had when I was standing at the airport in Tel Aviv looking out at Israel for the first time. I certainly don’t feel like I challenged myself by traveling to Dublin. So, my last night in Dublin, I did something scarey: I stayed up late, donned some heels, and went out dancing to experience Dublin nightlife. There’s something powerful in doing something that scares you a little, though. You have amazing experiences that you’ll never forget. You get inspired. You see the world a little differently. You build your own confidence. And you write better blog posts. So I’ll ask you this: When is the last time you pushed yourself to do something you you find even a little scary? Think back to that first international trip you ever took, or the first time you traveled by yourself, or the first time you set off on a trip without clear travel plans. Remember that excitement? Remember that heightened state of wonder? Remember that moment of trying to keep your lunch down while resisting the flight part of the fight-or-flight response? This is my challenge to you: Get back to that state again. Push yourself to not only have new experiences, but get outside of your comfortable little box and do something you wouldn’t normally do. That might mean traveling to an area of the world that frightens you. Maybe it means facing your fears to try something like skydiving or swimming with the sharks. Or for some people, going dancing is what they find truly scarey – and hey, that’s okay! The point is to do something you wouldn’t normally do. It doesn’t matter what other people find scarey. It’s only by pushing ourselves that we grow personally and professionally. When you take on new challenges and do things that scare you, you begin to see the world in a different way. And that, my friends, is one of the best ways to write better blog posts, no matter what your niche. So if you feel like your blog has plateaued a bit lately, take my challenge. Go out and do something you find scary, then tell your readers about the experience! Also, I want to invite everyone to share their plans here. What are you going to do that is scary? Or what have you recently done that scared the you-know-what out of you? Leave a comment so we can all encourage one another! Loved this! I am still waiting for my passport to arrive, and when it does I can’t wait to get outside of my comfort zones and see the world! Kudos to you for pushing yourself! That’s awesome, Heather! Make sure you take an “excited dorky I-got-my-passport” selfie like I did!!! My first overseas trip was to Slovakia and my expected travel companions all had last minute issues that left me on my own for three weeks. It definitely shaped how I travel today. My second trip was to Dnepropetrovsk, Ukraine. Very few people spoke English and it’s not a usual tourist destination. I did have a local acquaintance to show me around and help with my limited Russian language skills. But still a bit scary when I first arrived. I agree completely that pushing ourselves only makes us better in life and as travelers. I’ve come to look forward to the uncomfortable feeling that comes before a new adventure. Not knowing the language definitely makes any situation a little scarier. I kind of look forward to that slightly-uncomfortable feeling too, now! That nervous/excited feeling of butterflies in the stomach just makes life more exciting. Hey! Nice post, and thanks for linking my site. I’ve been to a bunch o’ places people might consider “crazy” – Sierra Leone, Côte D’Ivoire, Tajikistan, to sophomorically name a few – but I still think Israel is the craziest place I’ve ever been. I write about it here: http://willtravellife.com/2013/09/im-supposed-to-like-israel/. While you may not think your trip was that “insane,” I’d respectfully beg to differ. Israel is one wacky place! Kudos on your journey, and keep up the good work! Israel is a weird place. I actually loved being there and understand why so many business people move to Tel Aviv…BUT there was definitely always the feeling of “us-vs-them” rumbling under the skin as well, especially when I was in Jerusalem. I also went specifically to learn about tech and start-ups in Israel. What was neat about that 90% of the people I spoke to were super frustrated with the conflicts involving their country because they feel it holds back business. They brought it up even without prompting. So I do think that the cultural “racism” you talk about in your post is getting better. People know they have to work past it to grow, even when they’ve had personally bad experiences with a loved one dying due to the conflicts. Plus, I’m also an eternal optimist! 🙂 For all I know, people could have been saying very mean things in about me in Hebrew haha. Okay, how about bungee jumping? Definitely scary jumping from the highest bungee platform in North America (200 ft) but oddly enough the fear factor disappears the moment you jump! That would be a scary one for me for sure!!! Love it! Thanks for sharing, Ailsa! I totally recognise the border ‘interrogator’ story! We were accused of being drug dealing, western terrorists by Malaysian officials simply because we had a Pakistani visa stamp and a case full of paracetamol & travel sick pills! lol. It’s definitely been far too long since I did something that scares me! The bungy jump (being scared of heights) I did in 2011 was the last, so i’m well overdue!!….. You know though, as scary as I was…I didn’t mind if it means I’m on a safe flight! I went rock climbing for the very first time in Thailand last year. I was nervous, but it ended up being one of the best days ever! In a month we are heading to China. China makes me nervous because of the huge language barrier plus traveling in a country that really wants visitors to see it in a certain light. But it should be exciting! China definitely sounds scary and amazing. It’s on my bucket list! Don’t think this kind of content brings in an audience that advertisers find valuable. That sounds amazing! I love watching sunrises, so I can only imagine how neat that was to see it from the top of a mountain (and how scary it was to make the hike during the night). What a great payoff for taking a risk! Hope you enjoy it, Happy Halloween everybody!